Boone, NC (June 6, 2017) – Few things in life can seem scarier than the thought of surgery – especially for an 11-year-old. After her tonsillectomy at Watauga Medical Center, Lula Bovino awoke last December to find a teddy bear nestled beside her in the recovery room. This unexpected companion surprised and encouraged both Lula and her mother Natalie, a Registered Nurse in Appalachian Regional Healthcare System’s (ARHS) Anesthesia Department. Natalie’s supervisor and hospital Chief Nurse Anesthetist, Kevin Henson, assisted with the surgery. He was also the one who surprised Lula with the teddy bear. The Bovino family also posted an ad on Amazon. Their Web page allows donors to easily shop for and contribute bears to the cause. 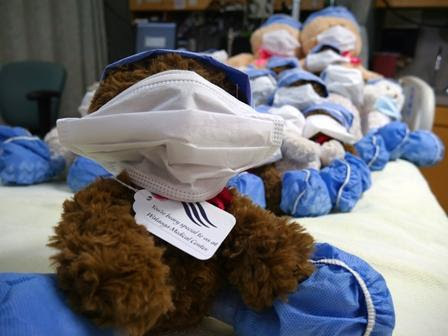 After the bears are received, Lula and Natalie carefully outfit each teddy bear with a pair of scrubs and a tag that reads ‘You’re Beary Special to us at Watauga Medical Center’. To date, more than 40 children have received a teddy bear from Lula’s teddy bear program. Lula is a 6th grade student at Blowing Rock Elementary School with a passion for singing in her church choir and playing any instrument she can get her hands on. Natalie works full-time at Watauga Medical Center and is currently studying to become a Family Nurse Practitioner. Despite their busy schedules, they reconnect in the evenings for special mom and daughter strolls around Bass Lake in Blowing Rock, NC. On these walks, they often skip rocks, play hide-and-seek and quiz each other with school related flash cards. Natalie also uses this time to tell her daughter if a teddy bear had been handed out that day at work. Lula, who has never witnessed a teddy bear patient delivery, loves to hear about the recipient’s reaction and whether or not it made a difference. It always makes a difference. For more information about how you can contribute to Lula’s teddy bear program visit http://apprhs.org/bears. To learn more about Appalachian Regional Healthcare System visit https://apprhs.org/.